Your first appointment with us will be longer than usual. Either the practice nurse or doctor will need to gather a full history to help ensure we provide you with appropriate health care. Your history includes gathering pertinent information such as medicine and food allergies, current medications, your family history, and your past medical history. On your first visit please bring the following (if applicable): Medicare card, DVA card, concession card and private health insurance card. Visits to our doctors are bulk billed. Special procedures such as IUD insertion, Implanon removing or insertion may incur an additional cost. These costs will be discussed with you in advance. Visits with our Medicare eligible Podiatrist, Psychologist and dietitian are BULK billed (there are no out of pocket costs). If you would like your medical records transferred to the Panacea Health Clinic, ask us for a records release form. 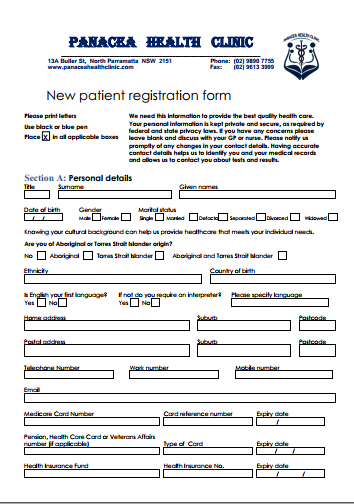 This form is used to give another doctor permission to transfer your medical records to our clinic. It is important that we have as complete a record as possible of your health history, vaccine records, and past pathology results and letters from specialists. We ask you to notify our clinic as early as possible if you need to cancel an appointment. By cancelling the appointment in a timely fashion you create an opportunity for another patient to be seen. We thank you in advance for your cooperation. The practitioners of Panacea Health Clinic make every attempt to maintain a timely schedule. However this is not always possible. We believe that it is of the utmost importance to give our full attention to each patient and family, and ensure all their questions and concerns are addressed. This may sometime cause a slight delay. In trying to maintain our schedule, some difficulty may arise when a patient arrives late. We understand there are numerous reasons why this may occur. Again we ask for your courtesy in calling our clinic, notifying us that there is a delay and providing an approximate time of arrival. If you will be more than 30 minutes late for your scheduled appointment, your practitioner will be informed and he/she will determine whether it is better to have the appointment rescheduled for later the same day or for another day. When our clinic is closed you can contact the National Home Doctors Service which offers home visits for treatment of illnesses requiring attention. This service provides backup if you are unable to see your doctor within normal clinic hours, or if you have a medical condition which cannot wait until the next day. National Home Doctors Service communicates with your doctor at the Panacea Health Clinic to facilitate continuity of your treatment and ongoing care. National Home Doctors Service is contacted on 13 7425. In an effort to maintain patient confidentiality and to minimise disruption, Doctors do not accept phone calls when in consultation except if it is an emergency. They may accept calls between consultations but will usually call the patient back. Confidentiality cannot be guaranteed with email communication. If you wish to communicate with us via email a consent form must be signed first (form is available from reception). Our practice has a system in place to follow up tests and results, reports and clinical correspondence where there is concern about the significance of the test or result. We will contact you by phone or mail if follow up is required. Results cannot be provided to you over the phone. Our practice welcomes feedback. There is a feedback box available in the waiting room. A feedback form is available at reception. If you have a complaint please ask to speak to the practice manager. In NSW contact phone number for the Health Care Complaints Commission is 1800 043 159.